Rock Climbing Down Under: Australia Exposed is an exquisite photographic journey to Australia's finest climbing destinations. It features 350 images by world renowned rock climbing photographer, Simon Carter, the result of over 21 years work. 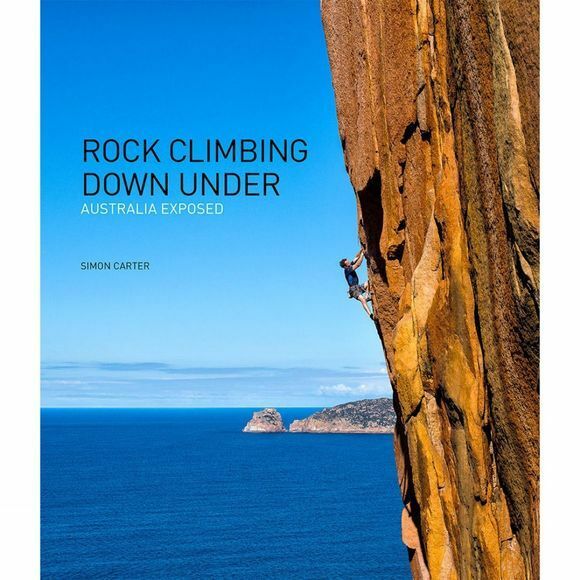 In addition to the images, this book contains personal stories and area overviews written by 80 individual authors, giving an unprecedented insight into the heart and soul of Australian climbing. This book offers something for everyone that has any affiliation with rock climbing. Photographer, Simon Carter, completely suspends us in twenty-one of Australia's climbing scenes. From the three dimensional prismatic rock jungle of Coolum cave; to the eucalypt scented crags of the Blue Mountains; the shady gullies of Arapiles with hexes clanging and belay calls echoing. Feel the gyroscopic giddiness of the Totem Pole; the parched desert wind tickling the ancient rock at Moonarie; and tremor under the thunderous force of the Southern Ocean pounding the granite walls of West Cape Howe. Accompanying the mesmerising photography are area introductions and personal stories written by no less than eighty climbers. Thread by thread, the climbers' stories weave a magical sentiment throughout the book. Laugh or cry laughing at the tales, join with climbing pioneers and live their experiences: squatting in a dingy Nowra cave on $1.75 a day; climbing past the 'do not fall' zone followed by a soft fall into the abyss; food foraging forays and living with mice at the Mount; and first ascent horrors in Bungonia Gorge. Kim Carrigan, John Fantini, Dave Jones, Kevin Lindorff, Neil Monteith, Chris Webb Parsons and Mike Law, are only some of the eighty talented climbing authors found in the book.